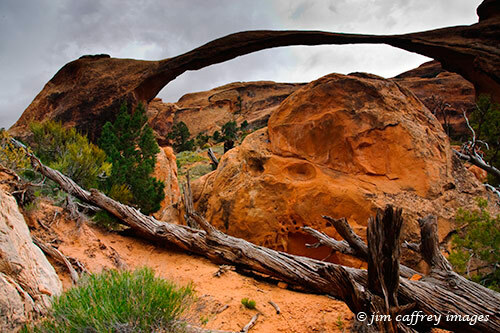 Landscape Arch is located in a remote part of Arches NP called The Devil’s Garden. The trail will eventually lead you to eight arches; it is difficult in places with a lot of scrambling over slickrock, and exposure to heights. We set out expecting to have plenty of time to make the entire 7.5 mile loop, but we had just made it to Landscape Arch (the third arch along the trail) when a thunderstorm moved in bringing snow and rain. I had just enough time to make a couple of exposures before packing my gear into my waterproof backpack to start the hike back to the car. Luckily we were only a little over a mile from the trailhead, and had sufficient wet weather gear to keep us, and my cameras warm and dry. 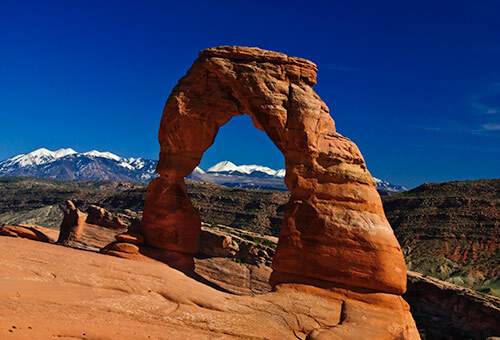 Another icon in the realm of nature photography, Delicate Arch is a favorite of visitors to Arches National Park. The well worn trail meanders across an upthrust ridge of slickrock for nearly two miles. The last couple hundred yards of the trail hugs a cliff face before you suddenly arrive at the edge of a huge natural amphitheater, and there before you stands this seemingly impossible structure of red sandstone. The experience is well worth the effort, but you have to be patient if you want to make an image that doesn’t include twenty or thirty other visitors. I was wishing for some dramatic clouds to take some of the edge off the deep cerulean sky, but had to settle for the snowcapped La Sal mountains. I am planning another trip to Arches soon. Maybe I’ll have better luck with the atmospheric conditions. Equipment: Nikon D200, Nikon 17–35 mm f–2.8 zoom lens, circular polarizer. Processing: Contrast, vibrance, and saturation adjustment in Lightroom, curves adjustment in Photoshop.